Moving materials within the sand pits was a difficult task using wagons drawn by horses. When the weather was bad, the tracks within the pits became muddy and waterlogged. The sand soon turned to quicksand making hauling the wagons almost impossible as the wheels sank in. 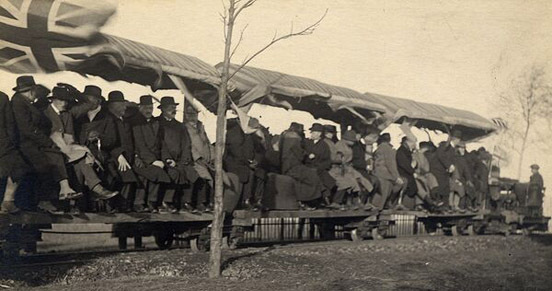 At first, wooden tramways would have been laid down to run the wagons on. As technology progressed, these were replaced by iron tracks. These were not bedded onto the ground and could be moved around the pits to where the wagons were needed. As the quarrying increased, barrow runs were constructed going from one side of a pit to the other and supported by wooden trestles. These were used mainly for carting the clay overburden from the new areas of the quarry to a part of the pit, which had been worked out. The demand for sand increased and was being hauled through the streets of Leighton Buzzard to the canal wharves and railway sidings for onward transport. Damage to the roads was immense and so was the cost to the pit owners in compensation for road repairs making quarrying less than viable. In 1892, it was proposed that a standard gauge railway should be built to join up the sand pits and connect into the existing railway network owned by the LNWR (London & North West Railway). This came to nothing and the sand industry was in danger of collapsing. World War One changed all that and sand was in great demand from munitions factories requiring ever increasing amounts of sand for foundry. Supplies from Belgium were halted when Germany invaded. Leighton Buzzard sand was found to be suitable and enormous quantities were sent daily by rail and canal. In 1918 local residents complained about the smoke from steam road tractors, but the Director of Factory Construction for the Ministry of Munitions of War decreed that the nuisance had to be tolerated as the sand traffic was of national importance. These steam tractors also caused damage to the road surfaces en route to the canal or mainline railway. The government paid for the upkeep of the roads for the duration of the war. After the end of the War the sand companies were held responsible for repairs to the roads. Then it became obvious that a railway was needed between the pits to carry the sand to the Leighton to Dunstable Branch Line and hence onwards to the rest of the country. The Leighton Buzzard Light Railway. 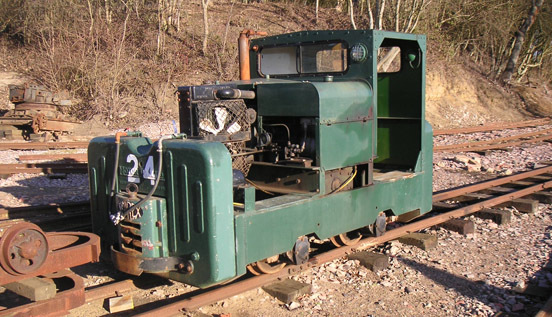 The two largest quarry operators, Garside and Arnold, put a plan forward to build a narrow gauge railway and so the Leighton Buzzard Light Railway came into being, allowing sand to be carried to Grovebury Sidings and tipped into standard gauge wagons. Work commenced in August 1919 and it was finished before the end of the year. It consisted of three and a half miles of track, and nine un-gated level crossings. The remit for the work stated that steep hills should be avoided and there should be no sharp curves. However, the contractor put in a gradient of 1 in 25 (Marley’s Bank) and two very sharp bends. They also used 25lb rail instead of a much heavy 30lb rail, and straight rails were made to bend round the curves. These cost savings were the cause of many accidents and derailments. The original plan was for the sand wagons to be drawn along the narrow gauge tracks by horse. However, at the end of the war, Hudswell, Clarke steam engines, built for the campaign in Italy, were put up for sale and two were duly purchased. They did not prove to be fit for the job and as the sleepers used to support the tracks were made from untreated wood from local woodland, they easily caught fire. Also, the sand in the wagons became contaminated by black smuts given off by the coal-fired engines. Another problem with them was that their tanks held only half the amount of water needed for each trip. Therefore, the locos had to stop at Swing Swang Bridge to top up the tanks from Clipstone Brook, which ran below. 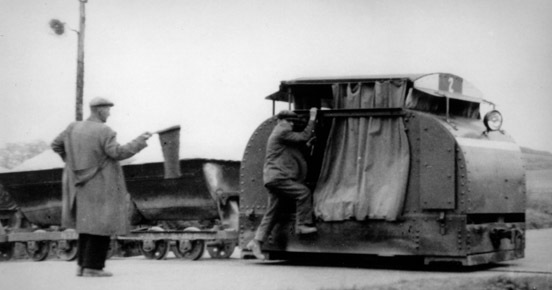 After only two years, the two engines were replaced by smaller petrol driven “Simplex” locomotives, brought back from the Western Front and sold off cheaply as war surplus. The petrol driven locos were eventually replaced by diesels. Heavy snow and ice sometimes impeded the running of the rolling stock, but the Simples locos were very reliable and suited to purpose. The decline of the LBLR began in 1955 after a national rail strike. Arnolds took a greater part in the running of the railway and eventually took it over in 1964. However, its days were numbered and with the closure of the Dunstable to Leighton Buzzard Branch Line, in 1969, sand ceased to be carried to Grovebury Sidings by rail. Although the locomotives continued to work within the quarries, by 1981 dumper trucks had taken over the work of the locomotives. The last commercial delivery of sand took place on 27 March 1977. In the meantime, a group of enthusiasts had formed a preservation society and negotiated to run passenger trains over part of the LBLR, taking over the whole railway when the carrying of sand ceased. The first public train ran on 3 March 1968, and in 1969, the name of the railway was changed to Leighton Buzzard Narrow Gauge Railway and now runs from Page’s Park Station to Stonehenge Works. The railway, although narrow gauge, has to comply with modern Health and Safety Regulations and Rules. A lot of work had to be carried out on the tracks for the safe running of the trains.